Joint is the meeting point of two or more bones. The joint allows the movement of bones. The bones of the spine are called vertebrae. Vertebrae are interconnected through facet joints, else known as zygoapophyseal joints or apophyseal joints. Every vertebra has two pairs of facet joints. The two processes (apophyses) sticking out of each end of a vertebrum connecting it with the upper vertebrum are called “superior articular processes”, while the two processes sticking out of each end of a vertebrum connecting it with the lower vertebrum are called ‘inferior articular processes”. They are located at the posterior part of vertebrae. The facet joints have a synovial bursa and the facets are covered with cartillaginous tissue so that they are smooth and can move without any friction. Facet joints allow for flexion, extension and rotation of the spine by keeping it stable. 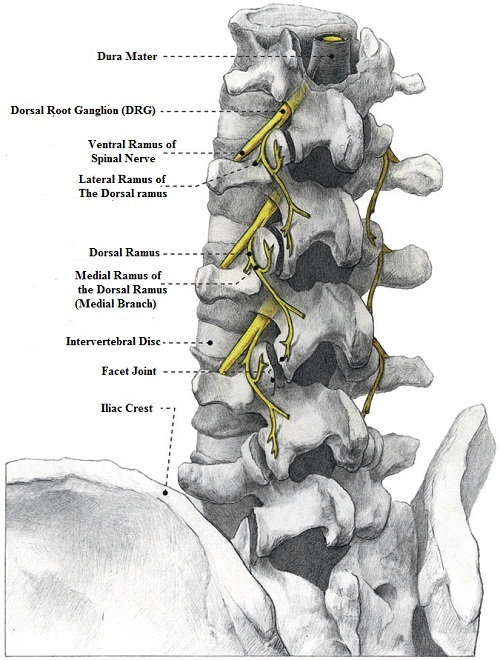 Each joint is innervated by two nerve rami which branch out into the posterior lumbar nerve trunks. These branches course along the groove that is formed where the superior articular processes merge with the transverse processes. Facet joints are responsible for pain in 15-45% of patients with chronic low back pain. (14-17) The disorder is more frequent in advanced ages and may be due to degeneration, strain and inflammation. (18,19) Radiological examinations very often show osteoarthritis findings and general facet joint degeneration, both in asymptomatic patients and symptomatic patients, and are not diagnostic modalities. Patients with low back pain due to facet joints complain about low back pain centrally or maybe slightly paravertebrally, not clearly located, which may radiate to buttocks and posterior thighs down to the knees. When the superior articular processes are affected, the pain may radiate to the hips and lateral thighs down to the knees. Very rarely does the pain radiate below knees. The pain is aggravated at the standing and sitting position, and is relieved when lying down. When getting up in the morning, the patient usually feels stiff and in pain. During the physical examination, patients report pain when pressure is exerted paravertebrally and during the extension and rotation of the spine, while the pain is relieved at spinal flexion. Should there not be any other pathology, the neurological examination is normal. The clinical examination and radiological evaluation provide some information but are not sufficient to set the diagnosis of the painful facet joint syndrome. The technique is applied with percutaneous local anesthesia and under radiological guidance. It is absolutely safe when conducted by a skilled Interventional Pain Physician (IPP) and the result lasts 9-24 months. Should the nerves regenerate but pain recurs, the therapy can be repeated as many times as necessary. The treatment is scientifically evidence-based and is strongly recommended by the international scientific community. 1. Guyatt G, Gutterman D, Baumann MH, et al. 466 • van kleef et al. Chest Physicians Task Force. Chest. 2006;129:174–181. clinical diagnoses. Pain Pract. 2009;9:247–251. explanation of many cases of lumbago, sciatica, and paraplegia. Boston Med Surg J. 1911;365–372. the articular facets, with presentation of an operative procedure. treatment of lumbar zygapophysial (facet) joint pain. Anesthesiology. characteristics. J Spinal Disord. 1996;9:40–58. guided anesthesia and steroid injection in facet syndrome. 8. Destouet JM, Gilula LA, Murphy WA, Monsees B.
of intra-articular injections for lumbar facet joint pain. value of facet joint injections. Spine. 1988;13:1407–1410. pain and sciatica: description of technique. Radiology. response. Arch Phys Med Rehabil. 1992;73:824–828. for chronic lumbar zygapophysial joint pain. Spine. chronic spinal pain of cervical, thoracic, and lumbar regions. AI. Lumbar facet pain: biomechanics, neuroanatomy and neurophysiology. structures in the human lumbar spine. Acta Orthop Scand. patients with chronic low back pain. Pain. 1992;49:325–328. referral from posterior lumbar elements in normal subjects. tissue and symptoms in degenerative lumbar spinal disorders. of spinal facets. J Neurosurg. 1975;43:448–451. lumbar zygapophyseal joints and dorsal rami. Clin J Pain. 36. Fairbank JC, Park WM, McCall IW, O’Brien JP. primary low-back pain syndromes. Spine. 1981;6:598–605. 37. Helbig T, Lee CK. The lumbar facet syndrome. review of anatomy, diagnosis, and treatment. Anesth Analg. blocks: development of clinical prediction rules. Spine J.
physiological motions. Spine J. 2004;4:141–152. pain. A prospective statistical study. Spine. 1988;13:966–971. syndrome a clinical entity? Spine. 1994;19:1132–1137. Revel’s model as a screening test. BMC Musculoskelet Disord. with the Delphi technique. Phys Ther. 2007;87:1348–1361. low back pain. BMJ. 2008;337:a2718. imaging and CT in osteoarthritis of the lumbar facet joints. of the lumbar facet joints. Crit Rev Diagn Imaging. facet joint injection. Br J Rheumatol. 1996;35:1269–1273. chronic low back pain. Spine. 1995;20:907–912. 53. Airaksinen O, Brox JI, Cedraschi C, et al. Chapter 4. 55. Shim JK, Moon JC, Yoon KB, Kim WO, Yoon DM. study with fluoroscopy control. Reg Anesth Pain Med. computed tomography study. Spine. 1997;22:895–902. 58. Ackerman WE, Munir MA, Zhang JM, Ghaleb A.
muscular origin? Pain Pract. 2004;4:286–291. 59. Cohen SP, Larkin TM, Chang AS, Stojanovic MP. in soldiers and retirees. Mil Med. 2004;169:781–786. deep somatic structures with charts of segmental pain areas. blocks for the diagnosis of cervical zygapophysial joint pain. to hit the reset button. Spine J. 2009;9:619–622. 468 • van kleef et al. pain. N Engl J Med. 1999;341:1426–1431. randomized controlled trial. Spine. 2003;28:1355–1362. 68. Silvers HR. Lumbar percutaneous facet rhizotomy. Spine (Phila Pa 1976). 1990;15:36–40. 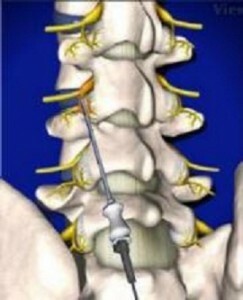 radiofrequency neurotomy for lumbar facet pain. Spine. signs. A randomized placebo-controlled clinical study]. low back pain. N Engl J Med. 1991;325:1002–1007. placebo. Scand J Rheumatol. 1984;13:238–242. outcome of facet joint injection with bone scintigraphy. Radiology. the diagnosis of facet syndrome. J Nucl Med. 1995;36:37–44. prospective controlled double-blind study to assess its efficacy. lumbar facet denervation for chronic low back pain. Spine. lesion-controlled trial. Clin J Pain. 2005;21:335–344. 79. Tekin I, Mirzai H, Ok G, Erbuyun K, Vatansever D.
guideline. Spine (Phila Pa 1976). 2009;34:1078–1093. B. 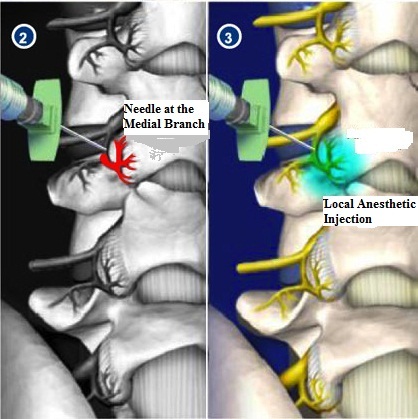 Complications of lumbar facet radiofrequency denervation. in the treatment of low back syndrome. Pain. anatomy of lumbar medial branch neurotomy (facet denervation).